"Medical Statistics at a Glance" provides a concise and accessible introduction to and revision aid for this complex subject. 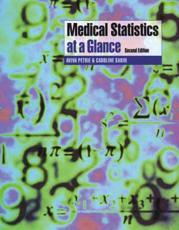 Following the familiar easy-to-use at a Glance format, it leads the reader through a number of self-contained chapters which explain the underlying concepts of medical statistics and provide a guide to the most commonly used statistical procedures. T his new edition of "Medical Statistics at a Glance": contains a second colour throughout to enhance the visual appeal presents the key facts accompanied, where appropriate, by clear and informative tables and diagrams features worked examples in each chapter, with emphasis on the interpretation of computer data analysis rather than on complex hand calculations includes new chapters entitled Rates and Poisson regression, Generalized linear models, Explanatory variables in statistical models and Regression models for clustered data has an accompanying website containing supplementary material including an extensive reference list and multiple choice questions (MCQs) with interactive answers for self-assessment. "Medical Statistics at a Glance" will appeal to all medical students, junior doctors and researchers in biomedical and pharmaceutical disciplines. Reviews of the last edition 'All in all, this is a book that I would highly recommend to the target audience. Concise, accurate, broad coverage, in an easy-to-use format...buy this and you will have the best set of lecture notes in the class! - "The Statistician, 2001". "The more familiar I have become with this book, the more I appreciate the clear presentation and unthreatening prose. - "Journal of Epidemiology "...I unreservedly recommend this book to all medical students, especially those that dislike reading reams of text. This is one book that will not sit on your shelf collecting dust once you have graduated and will also function as a reference book. '4th year medical student, Barts and the London Chronicle, Spring 2003 "an excellent job of making medical statistics as relevant and painless as it possibly could be...if statistics give you headaches buy it"GKT Gazette. "It is now a valuable companion to my statistics course - "International Journal of Epidemiology". "As one who generally has not got a clue whenit comes to statistics, this is a book I would definitely recommend - "Surgo: Glasgow University Medical Journal". "This book...was actually enjoyable to read - "Cambridge Medicine. "Nothing is too obscure, there are lots of worked examples, and clear diagrams. Go Buy!- "Sphincter - Liverpool Medical Students Society Journal".